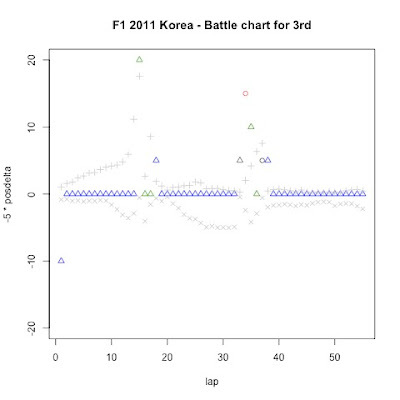 A quick review of the F1 200 Korean Grand Prix. For the laptime heatmap, I suggest a threshold of 115% from fastest lap. 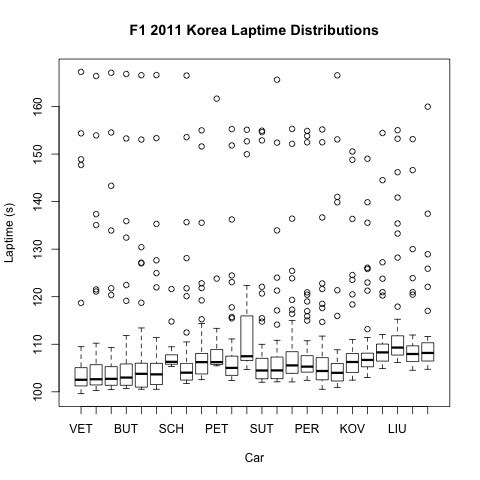 The cars are within 107%, and the laptime spead due to the fuel effect is about 6s in the Korean 100s lap. You might be able to go a bit tighter, but 115% should give a nice start. 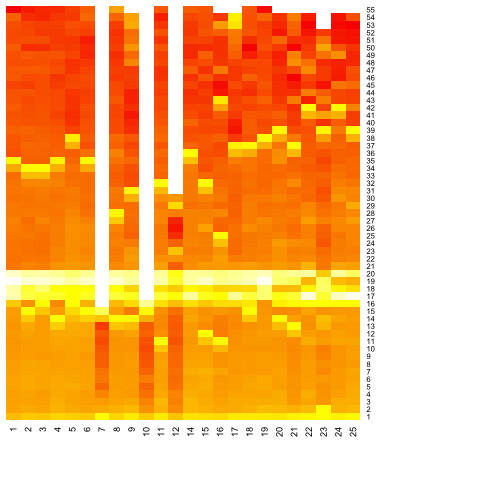 Then the fuel corrected heatmap should be nicely different. If we can get that looking good, then we should be able to get tyre degradation. Or perhaps greenness of track. How can I best send you a .png or two? Something else i want to be able to do is plot fastest lap to date laps, and also find a way of highlighting PIT laps. 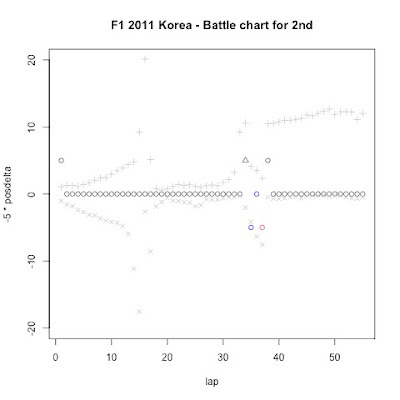 I was also pondering the difference in our approaches (ignoring the fact that you are way more knowledgeable and insightful than I am..) I think part of it is that I am interested in generating visuals that in part summarise race and quali data at the level of the 'average' (or even just the occasional) F1 fan and help identify stories at that level, whereas your analyses are far more meaningful but to a more sophisticated fan? So for example, that my charts sort of show pit behaviour and safety car is enough of a summary for the chart to meaningful at the level of 'basic event detection'? The battle chars also try to pick out possible narratives of interest from the race, compared to the race history chart, which has a far hight information density but can only be appreciated by a more knowledgeable reader? I think that there is a lot complementary in the approaches. I think that there's a huge amount in the data which tells a story that is not always told, and can clarify why some things happened the way they did. Where I would really like to get to is to establish the model 'behind the scenes' as a source of knowledge that can be believed to some extent (depending on assumption levels necessary to produce the analysis), but then to be able to communicate the findings in a clear way. The model communicates to experts, but I think that what is learned can be made accessible to the casual viewer. So I am very interested in what you are doing. 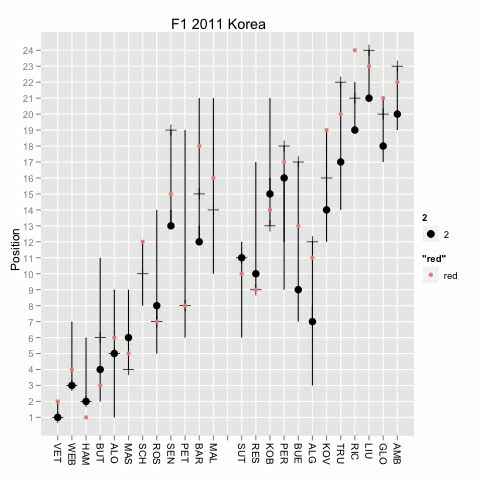 The difficulty with raw laptime data is that the pace of the cars is hidden behind fuel/tyre effects. Where I really want to get to is to remove the effects of tyres/fuel/+++ in order to be able to demonstrate what is 'real' underlying speed and what is not. So if I can filter my findings (essentially an underlying pace) through the sort of visualisation that you can produce, we can get the 'real' story communicated. I guess you have everything automated - I (+ my computer expert!) did a real time experiment on the Korean race - some bugs, but we should be close for the next one. Are you interested in doing this in real time? I noticed the fuel weight penalty model - and I also use a linear model which is the same for each car. Essentially, I match the laptimes on new tyres (of the same compound) across a number of cars to get it - it's pretty consistent, certainly within my error margins. There are a number of figures quoted on the web - I find that I'm somewhere close. Underfuelling is an issue, but you can usually see it in the race profiles (consistent different pace and step change between two pace levels). What bothers me is that the 'true' pace of the cars is hidden behind fuel/tyres/strategy and is not the speed the cars are actually going... I started this because of a Brundle commentary moment in Valencia where it was stated that Perez was ruining his race by staying out when 5s off the pace. I was sure this was wrong - so I set about demonstrating it. If the 'real' pace of the car can be revealed then there must (surely) be a good way of communicating this to the viewer to improve the race-watching experience.